Friday Feebies: BJ's warehouse membership, Baby body wash, Kindle for PC and more! This week's freebies include a 60-day membership to BJ's warehouse club, access to 420,000 books online, and free product samples from L'Oreal, Pssssst Instant Spray Shampoo, and Baby Barn. Enjoy! Get a free 60-day membership to BJ's warehouse club when you present the coupon you can print from the above link at the member services desk. This freebie is for new members only. Bring a photo ID when you apply for membership. Each membership comes with a second one for another person in your household at no extra charge. You have to bring the coupon to your local BJ's before July 5, 2010 to get the deal, but this coupon may not be available all the way to July 5. You get my drift? So make sure to print out a copy now if you're interested. 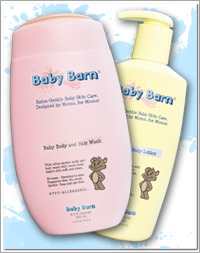 Get two 2.5-ounce free samples courtesy of Baby Barn, including Baby Body and Hair Wash and Baby Barn's Soft Skin Baby Lotion. Fill out the request form with your name, email, and address. The freebie started March 22, 2010 so I wouldn't be surprised if it ran out soon. The Baby Barn site claims its products are "all-natural, organic, vegan, cruelty-free, and extremely effective." You can read 420,000 e-books for free on your computer with free Kindle for PC software. No need to buy a pricey Kindle to get these free books, which include 101 New York Times bestsellers. Of course, there are also thousands of books for sale, from $10 and up. The Kindle teases you with the first chapter free to help you decide if you want to buy it, which is actually pretty cool. Or addicting. What is not included in the Kindle for PC software are newspapers, magazines, and blogs. Get two free samples of L'Oreal Paris hair care products right now when you register on the make up site. The free samples are for EverStrong, a shampoo and conditioner line that claims to make your hair stronger in just one wash. And the second is for EverPure, a shampoo and conditioner line that claims to retain the color of treated hair. To get the freebies, click on the above link. Then click on the lower left corner where it says "Special Offers & Savings." That takes you to a page where you can request the two free samples, enter two sweepstakes, and print two coupons for L'Oreal products. Get a free full-sized bottle of Olay Quench Body Lotion and a smaller related Olay Quench product when you use two coupons and send in a mail-in rebate. Here's how it works. Get a free travel-sized sample of Psst Instant Spray Shampoo, courtesy of Redbook, when you sign up for its email newsletter. Create a password for the site and share your address and phone number to get the sample. Pssst Instant Spray Shampoo helps remove oiliness when you don't have time to wash your hair (or don't want to). I've never tried it but it sounds pretty interesting. The freebies are on a first-come, first-serve basis, so it's unclear when the samples will run out.